Q: How do I start a new conversation with a patient? If you wish to send a conversation on behalf of your clinic to a patient, ensure that you have the clinic selected from the "You are acting as" drop-down. To: Begin typing the name of the user you would like to send the conversation to. *Note: New conversations can only be sent to users to whom you have as a contact and are connected to on myHEALTHware. For information on how to add a new connected contact, please see: Invite a Contact to Connect with you on myHEALTHware. 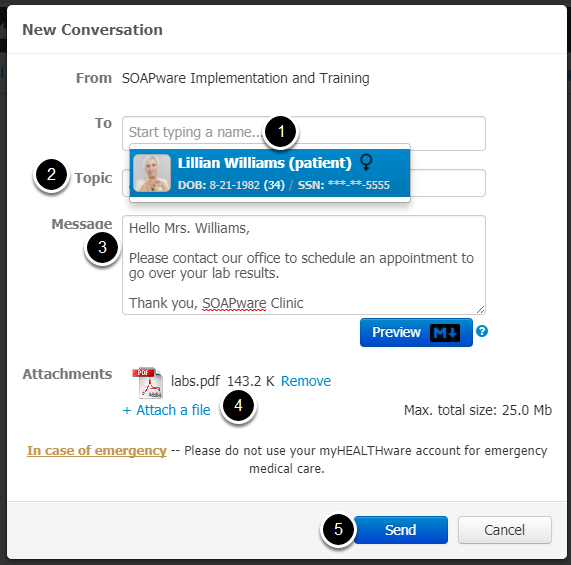 For instructions on inviting a patient to connect in myHEALTHware, please see: Managing Patient Accounts in myHEALTHware. Topic: Enter a topic for your conversation. Message: Type your message to the patient in the box provided. Attachments: If desired, click the Attach a File button to include an attachment. For instructions on attaching a file to a conversation, please see: Attach a File to a Conversation. The new conversation will be stored in your Conversations inbox. To view the details of your new conversation, simply click on the conversation that is located in your inbox.